Beans are my emergency food. They are very nutritious. The dietary guidelines suggest we increase our intake of beans and I took this as one of our family goals in 2013. 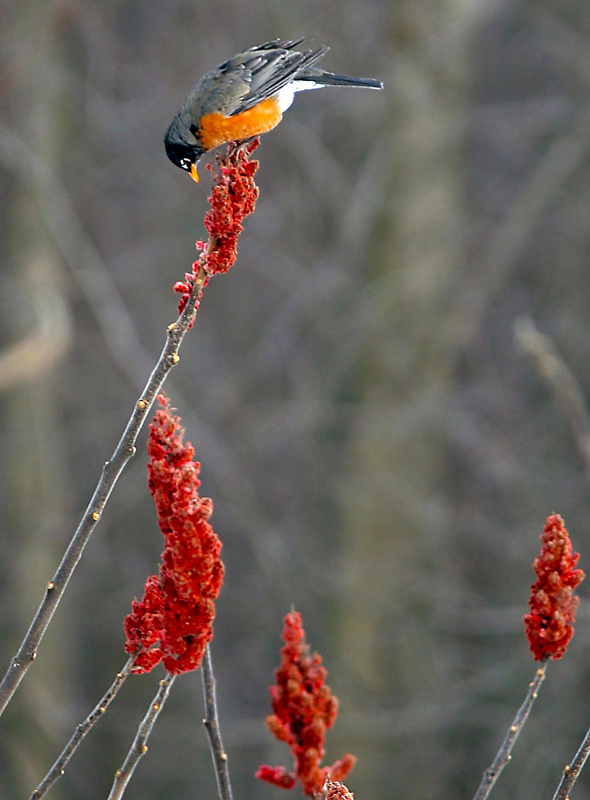 I took our dog Abi for a walk this afternoon and I saw this robin eating sumac berries. The sumac looked so red and appetizing to me that I went to my computer and started doing some research if I also could eat them. I love gleaning. Can’t wait to try this lemonade next summer. I am constantly looking for good deals on beans. Almost every time I get groceries, I think of how much beans I have at hand and almost always bring a bag home. I store them in glass jars away from direct light and try to keep about 6 cups of each around, which seems like a lot for a family of 4. I make a lot of bean dishes and take to work, Brazilian cooking classes, to church, and share with friends. Our favorites legumes are Pinto, Black, Navy, Garbanzo beans, lentils, and green split peas. We are never bored. I usually keep one pound of small red or kidney beans, black eyed peas and fava beans for a rotation. I usually cook 3 cups at time, which gives me about 9 cups of beans that I can make a meal with leftovers and freeze the rest. I do use a pressure cooker for my beans most of the time, but love the slow cooker because I can come home to a meal! In a 4-quart slow cooker, add beans and cover with 4 inches of cold water and to soak overnight. In the morning or about 8 hours later, rinse the beans and put it back in the slow cooker, covering them with water by 2-3 inches. Cover the slow cooker with a lead and cook on low for 8 hours or high for 4-5 hours. Season to taste, keep in the fridge for up to one week or freeze 2-3 months (here some recommendations) . 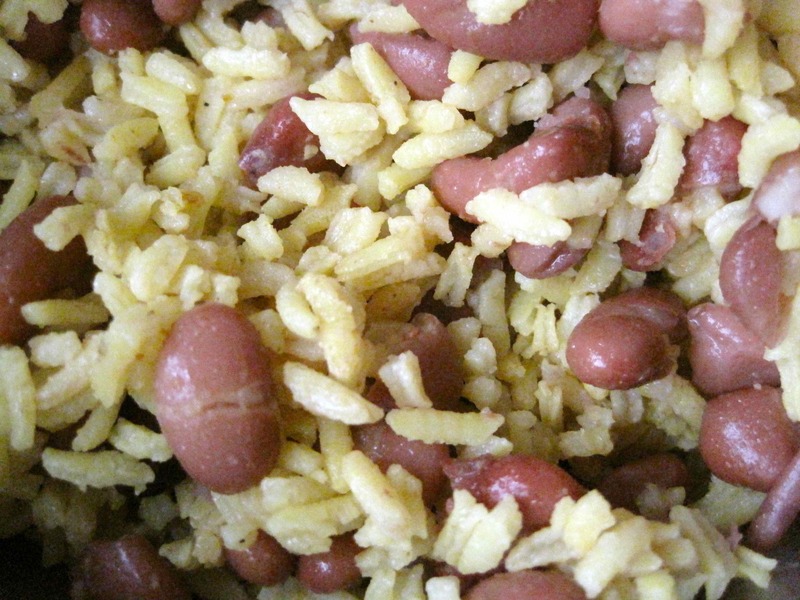 This recipe works for Pinto, White and Black beans. If you are cooking red or kidney beans using the slow cooker, you should boil them for 10 minutes first, before adding to the crockpot to avoid possible toxins. Thank you Stephanie from “A Year of Slow Cooking” for writing about this. Thursday night I had a meeting at Oakwood Community Center and in 20 minutes I made yellow rice and mixed in some cooked pinto beans to take for the potluck. 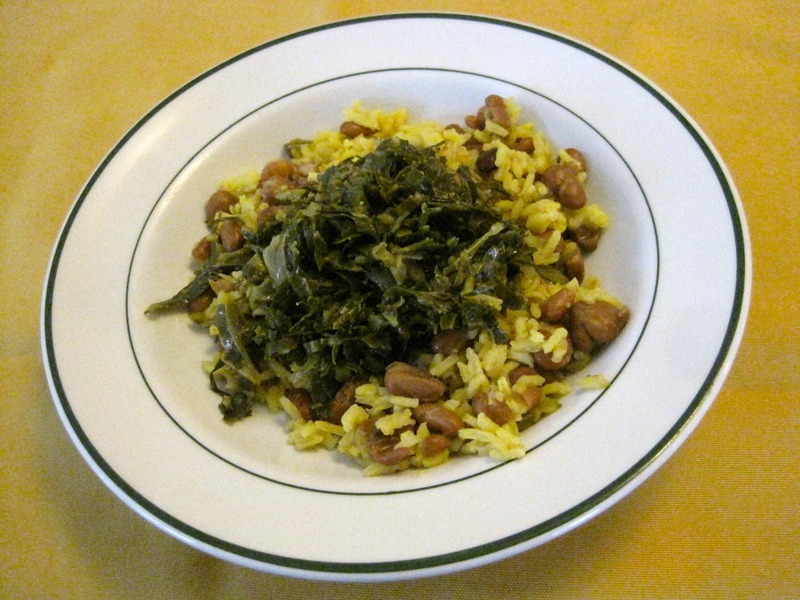 Bonus, I added collard greens to the leftovers the next day!